26.2 Quest: Run The 13.1 Atlanta…For Free! When I have been in a running funk, I find no better motivator than to sign up for my next race that will require some training. I usually pride myself in being half marathon ready at any given time, but this is one point since I started running that I cannot claim that. The first two years of the 13.1 Atlanta were highlights of my running journey and I look forward to this third year. The problems that plagued the start of the 13.1 Atlanta in the first two years have been addressed with small changes to the this year to the course that find it starting and ending at Town Brookhaven. If you would like more information on the new course and my thoughts you can stop by and read the press release that I helped promote a couple weeks ago. And now to the good part….. US Road Sports wants you to run the 13.1 Atlanta. If you have run the race in one of the first two years you know how challenging, and yet enjoyable the course is. If you haven’t run this course yet, you don’t want to miss this years race and all the excitement that will be centered around the new start/finish line in Town Brookhaven. The US Road Sports group has given me the opportunity to run this year, but more importantly they are giving one of you a chance to run this race for free as well. The first two years I ran this race it was part of my 26.2 training. I am sure there are many of you in the same place, looking for a half marathon to add to your marathon training schedule. What better way to test your racing legs than to run a 13.1 mid-way through your full marathon training. If the full marathon distance is not for you, the October date is still nicely placed in between the heat of summer and the busy holidays leaving very little reason to not lace up those shoes and register to run the 13.1 Atlanta. 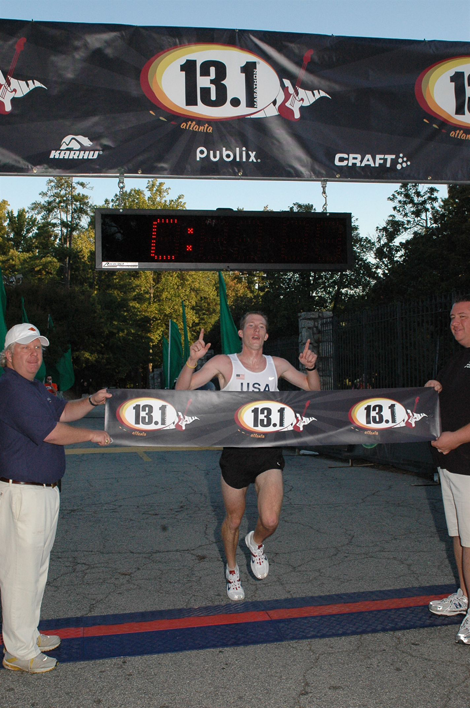 One lucky winner will receive a FREE entry into the 2011 13.1 Marathon Atlanta run at 7:00 am on Sunday October 2nd. Entries will be taken through August 12th with the winner chosen randomly from all entries received. The winner will be announced over the weekend. Have you run any of the races in the 13.1 Marathon series since their inception two years ago? If so tell us which one(s) you have run. Follow the @131Marathon Twitter account and tweet this giveaway by clicking here. Like the 13.1 Marathon Fanpage and Share this giveaway on Facebook using http://262qst.com/dsTZr and tagging the 26.2 Quest Fanpage as well as the 13.1 Marathon Fanpage. Please leave a comment for each of your entries to ensure no entries are missed. To make sure you don’t miss the winner announcement on Tuesday morning make sure you join the community at the 26.2 Quest Fanpage, follow the @262quest Twitter stream, and subscribe via RSS. There is always something going on and I would love to have you as part of the community! A half marathon has been my longest run but I am currently training for my first full marathon.I haven't run any of the 13.1 series, but hopefully I'll be running 13.1 Atlanta. The longest race I've ever run was a 5k! I'm making an ambitious goal of finishing the 13.1. I joined a running group and I have lots of 13.1 veterans sharing their sage advice. October 2 is also my 13th wedding anniversary- can't imagine a better way to celebrate 13 years than running 13 miles! I did this race last year. It is a pretty route, but I'm glad they have worked on the start and finish. It was still a good race though. I ran the Atlanta 13.1 last year for the first time. It is my favorite half marathon that I've run so far. I haven't run the 13.1 before. The thanksgiving day half marathon was my longest run. I haven't done a run that long since although I am training! My longest race (SO FAR) was a Marathon last fall.. Considering moving into ULTRA's. I haven't run a 13.1 with this group yet. 4 marathons are my long runs so far. Have you already drawn a winner? My longest distance was the 14.2 Miley in tupelo. I've run the old Thanksgiving Day 1/2 marathon in 2007 and then the Georgia Marathon in 2008, 2010, and 2011. Hope I win!! Check it out...you may win a free race entry!